Paying bills, keeping in touch with friends, trying out a new hairstyle, watching politicians make idiots of themselves, listening to Lady Gaga’s new album, learning about our health…. How did we manage before the Internet?! Internet access can change even the most resource-deprived wards into information-rich environments. 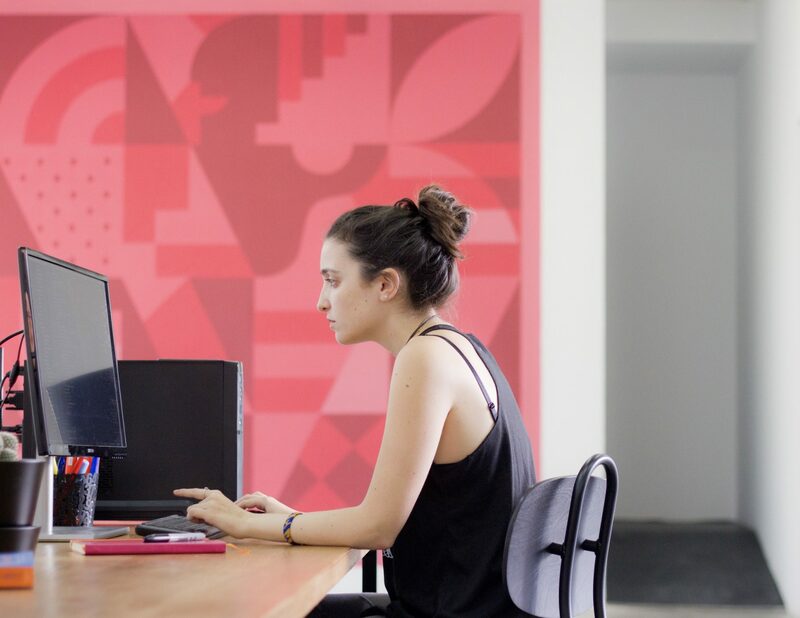 Nowadays being computer-savvy is becoming an increasingly important life skill. The internet gives patients the ability to connect with friends and family around the world via email, chat rooms and social media. This helps them maintain important links and relationships at a very difficult time in their life. The long list of creative ways in which wards are enabling patients to have Internet access illustrates the change over the last few years from widespread concern about introducing the Internet to a consensus that it is essential on most wards. Implementing this commitment has been a bit of a slog for most wards, with tedious difficulties from BT and enough red tape to gift-wrap the hospital many times over. We salute the tenacity of ward staff who have heroically gritted their teeth and kept going til the first patient sends off their first email! And we’re very grateful to pioneers such as Croydon and Gloucester for generously sharing their protocols and guidelines with other wards. Provide service users with their own memory stick or disc. The team can then download specific requested information and place on the service users memory stick or disc for them to access via the computer suite. Each ward has a lap-top and broadband, and the hospital has wi-fi, which is ideally flexible, and by definition wire-free. In addition to all the usual stuff done by patients on the Internet, staff also help with downloading music to their MP3 players. Computer room – only complaints are about slowness of broadband and desire for 2nd PC! The art room provides Internet access, which was a huge performance to set up. They were given conflicting advice about how to secure Trust approval and finally discovered there’s an application form. It involved lots of follow-up phone calls to fix up computers, broadband, phone line, router etc. But it was worth it! They run an Internet Café once a week, with tea, cakes and Internet access; the OT tech runs it, and patients can also use it in timed slots during the week. Nurses are supporting and monitoring it eg to prevent manic spending. They’ve developed an Internet policy, based on preparation done by the OT. Computers and internet access, eg for patients having access to their bank accounts etc. The cafe area “The Oasis” includes an internet cafe style. The second terminal in the reception area is used as an information ‘what’s on’ type resource. The wards have internet access and service users access the internet for specific queries with staff. Currently all the inpatient wards have a standard computer that is available for service user use. 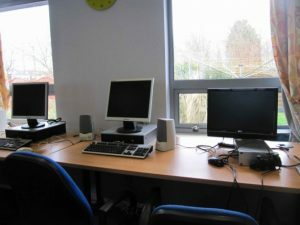 Regular ward-based computer groups/sessions are made available throughout the week as part of the therapeutic program. 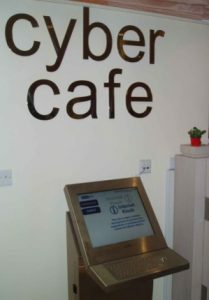 Both wards within the hospital have ‘Internet Café’s’ where patients have their own password to access the internet. There is an internet café in each unit. Some service users have also chosen to bring their own Lap Tops/ Mobile Phone onto the Unit so they can have Internet Access via a dongle. Linking with local college’s e-learning scheme, which uses the exciting art of mobile technology to improve english, maths and basic IT skills through mobile phones, pocket computers and the internet. The local FE college come in to interview patients and enrol those who want to join. And when ex-patients start at college, they feel less thrown in the deep end because they have had a foundation in hospital. The Learning Resource Centre, in a building adjacent to the hospital, was grant funded with British Telecom a number of years ago for service user and staff usage. The centre is equipped with about 12 terminals and is linked with the local further education college and is staffed by the Trust. It teaches patients all things to do with computers ranging from basic to advance course. Service users use IT on an individual basis and Occupational Therapy have set sessions there on a weekly basis. Some patients use internet to research their medication. Booking system for PC, sorted out at breakfast meeting. Local Mind group has Wireless Outreach Network. Patients in acute wards can get computer training through three sets of wireless laptops. The Internet is mostly used for communication, patients’ own research (including into their illness, its management and treatment), finding a ‘stimulus’ e.g. a walk through the virtual Tate gallery, exploring a hobby, even setting up a learner’s mobile phone! The recovery courses focus on using Word as a medium for CVs, letter writing etc. The qualified tutor and learning support assistant take in digital cameras and then show learners how to e-mail pics taken to friends and family, and even how to design Powerpoint presentations. Some learners take their newly found Internet skills into the local libraries after they leave hospital. Fabulous computer room with an expert member of staff supporting patients to do incredible things with the equipment. Some patients can use PCs and want to expand their computer literacy. A brilliant thing is that patients can use their photos to create personalized gifts such as plastic photo coasters, keyrings and magnets. Services users stated that they would use the internet for a number of reasons including; Email and other communication mediums, CV writing , work processing, internet information searching, digital photo editing and e-learning. Patients look up events, classes, courses and other local facilities. This plays an important part in their discharge planning community plans. Access to the internet should be risk assessed for each individual. Some individuals may not need supervision, others will however need to be supervised initially by a member of staff; this may be intermittently or constant in order to support an individual to use the internet effectively. Service users are made aware that they should never share personal information (name, address, telephone, or credit card number) online. Buying items on the internet should be closely supervised. Service Users are responsible for good use of the Internet just as they are within the ward environment. Got round the problem about Trust anxiety about patients hacking into the network by… having a stand-alone, unnetworked PC! How simple is that?? And they got round the phoneline (or lack thereof) problem by using wireless connections. Clear guidelines are set in order to ensure safety when using the internet and that access is not abused. A member of staff is allocated on each ward who is sufficiently trained in the use of computers and the internet in order to offer guidance, support, teaching and monitoring of the use. I used the ward computer to find out as much as possible about my diagnosis. The staff were really helpful by giving me a list of sites to go to. I was so worried that I wouldn’t be able to pay my rent whilst I was on the ward but the staff helped show me about internet banking and now I can pay all my bills even when I’m not well. I use the internet to manage my bills and finances.